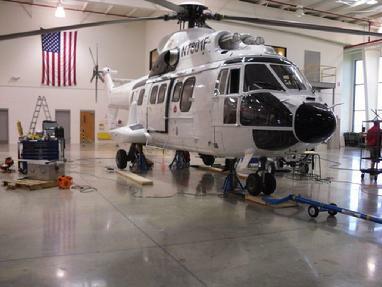 Large Eurocopter helicopter scale kits are available, both top of jack kits and roll on platform kits. 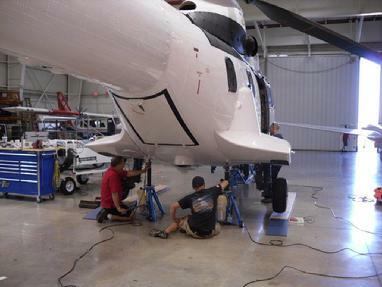 Helicopter weighing, Airplane weighing, Aircraft weighing, our basic kits will do all. Puma nose jack point detail for top of jack weighing. Tronair jacks used on this project with our M2000 weighing system installed. Note: If you have Meyers jacks, we support that jack type as well but our jack adapters must be used with the Meyer type jack ram as it does not have the one inch mounting hole. Click the picture to go directly to your jack adapter page to view the Tronair jack mounting as well as the Meyer jack mounting using our ram adapters. Puma rear view of jack top application. 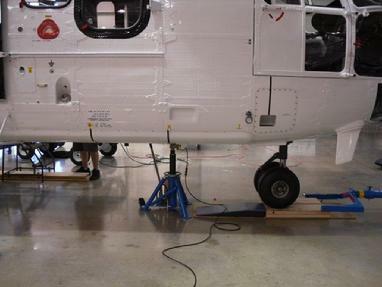 Standard top of jack use kits can be used on several types of helicopters, this kit being used is our 10,000 lb per cell kit reading in a 1 lb count. This system has the ability to weigh a Puma, EC145, or down to a small helicopter like a MD500 giving you the widest range of use with a single tool! Call Larry Jackson today at 561-281-6179 with your needs or types to be weighed, we custom build and have higher and lower range equipment available.